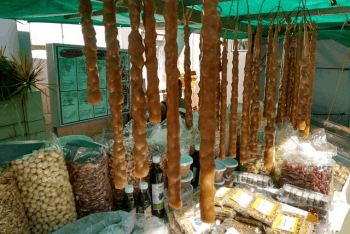 Looking to Take Home a Taste of Cyprus? Produced by double-distilling the local Xynisteri white wine in oak barrels, Cypriot brandy is the alcoholic element of the traditional Cyprus cocktail known as Brandy Sour. For an authentic recipe, you also need to take home local lemon cordial as it’s just not the same made with other brands. Devised in the 1930s heyday of the Forest Park Hotel in Platres, Troodos, this tall golden cocktail allowed the Muslim King of Egypt to indulge in a tipple whilst entertaining local dignitaries. By creating a drink resembling iced tea, Stelios, head barman, enabled King Farouk to enjoy his reception without anyone uncovering his secret! 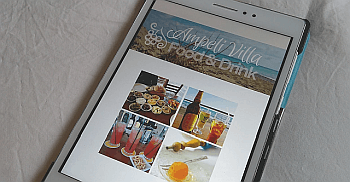 As time passed, the recipe spread to drinking establishments and restaurants throughout the island, becoming a firm favourite with both locals and visitors. 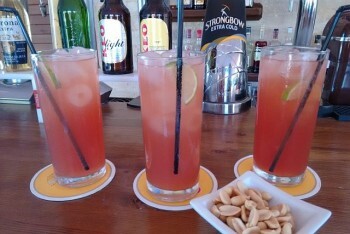 Today it is regarded as THE Cyprus cocktail. The recipe for Filfar was developed by Takis Philippou as he worked for the British Army in Famagusta during the 1940s. His cookhouse role involved preserving local fruit in jams and marmalades. Having seen his grandmother make an orange liqueur using an ancient recipe from the monks at Kantara, he started experimenting with quantities and ingredients, using his army friends as tasters. Demand quickly grew, and before long he was making the drink commercially. After losing everything in the Turkish invasion in 1974, Takis gave up his business. 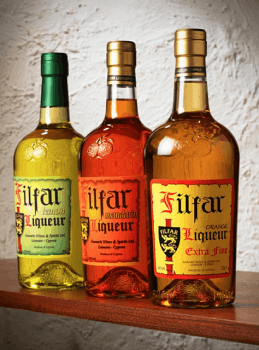 Fortunately Filfar production was revived in 1991 when Demos Aristidou, another Cypriot drinks maker, persuaded an Takis to sell his precious recipe. Still a closely guarded secret, up to 20 oranges of two varieties and three different herbs are used to make each bottle. Production is seasonal – beginning in early December with the orange harvest in Fasouri near Limassol – and continuing for four months – with much of the process still completed by hand. Count yourself an honoured guest if a hospitable taverna owner serves a freebie at the end of dinner. This 45% proof firewater is also produced from Xynisteri dry white wine. The high alcohol content, and ready availability has led to a variety of medicinal uses, including treating wounds, massage, a cold and toothache remedy, or as a winter warmer. Dating back to Venetian rule of the 14th century, this fiery concoction is still made in the traditional way. Grape pomace (remains such as pulp, peel, stalks and seeds) is mixed with high-quality dry wines, which are then distilled and matured. Usually drunk as an aperitif, Zivania is best served ice-cold straight from the freezer. για μας ! | gia mas ! | cheers ! Fruit such as apricots, oranges, lemons and cherries, but also vegetables or nuts in syrup traditionally served on a spoon at the end of a typical Cypriot blow-out meal. Perfect for when you haven’t got room for a full dessert, but you just fancy a little sweet with your post-dinner drink. Our fav is walnuts which are picked green and soft and preserved whole. Visitors are welcome at the Katerina Cyprus Sweets factory in Doros village – a 15-minute drive inland towards Troodos from Limassol. 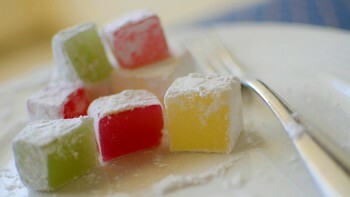 Soft, jelly-like sweets made with sugar, cornstarch and flavouring, plus sometimes nuts, finished with a dusting of icing sugar. The main traditional flavours are rose, lemon, mastic and bergamot, with chocolate as a more modern addition. The island’s main factory is Aphrodite Delights at Geroskipou in Paphos where visitors can taste samples before buying, and watch the production process. For more information, check out these Trip Advisor reviews. 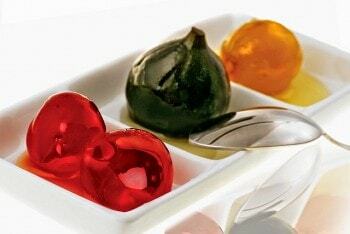 A chewy sweet made from boiled grape juice in the wine villages of Troodos and Paphos. Almonds are threaded onto long strings, dipped into the hot juice and flour paste mixture, then hung to dry. The dipping process is repeated several times until the desired thickness is reached, then the soutzouko is dried over the period of a week and stored. Cut into slices, it is a treat served at traditional festivals and celebrations such as Christmas and New Year. Making use of locally grown nuts such as almonds and peanuts, along with a topping of sesame seeds, this is an early Cypriot version of a cereal bar. The traditional recipe uses another native ingredient – carob honey – to bind the nuts together. καλή όρεξη ! | kalí órexi ! | bon appetit !